This recipe is the property of Dank1 and released under the CC Attribution-NonCommercial-NoDerivatives 4.0 license. You may not copy, derive or commercialize this recipe without following the terms of this license or the explicit permission of the creator. Tastes pretty good. I get a chlorine vibe from it at times. Made it 100% to spec. No subs. I think there is some serious muting going on in here. Still tastes OK. Slays your coils. 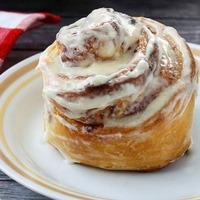 This is a spot on cinnamon roll with cream cheese icing and it was definitely worth the wait. If you're not leary about sucralose or FW Yellow Cake, give this a mix.